This week expansion of the “wreck of the week” concept to embrace the whole world continues with the United States. http://www.oldcarsweekly.com/features/smashed_dashes_and_crumpled_fenders. A site which uses the term “wreck” to mean involved in a body-altering accident. It shows how many uses the term can be put to. Some of the cars here are a mystery to me, not having my nostalgia from the correct side of the Atlantic. However my more general sense of sadness at the loss of something once great is certainly called into ascendancy by this site. This week I found a “rust in peace” in Ireland. It is also a YouTube Video so kills two birds with one stone. Instantly I must apologise for the dire soundtrack and that the guy filming it was trying to catch a bus at the same time. If I were you I’d mute it before clicking on it. I haven’t found a way of playing videos at a slower speed though. Any technical person’s amongst you who have solved that let me know. Yet again no idea where any of these cars are and so we must assume lost forever. I notice that some images in that video are suspiciously similar to one another. I think some vehicles feature more than once. Hey he put something interesting on YouTube so who am I to criticise. The Wreck of the Week for this week sold at a price that is within my reach. 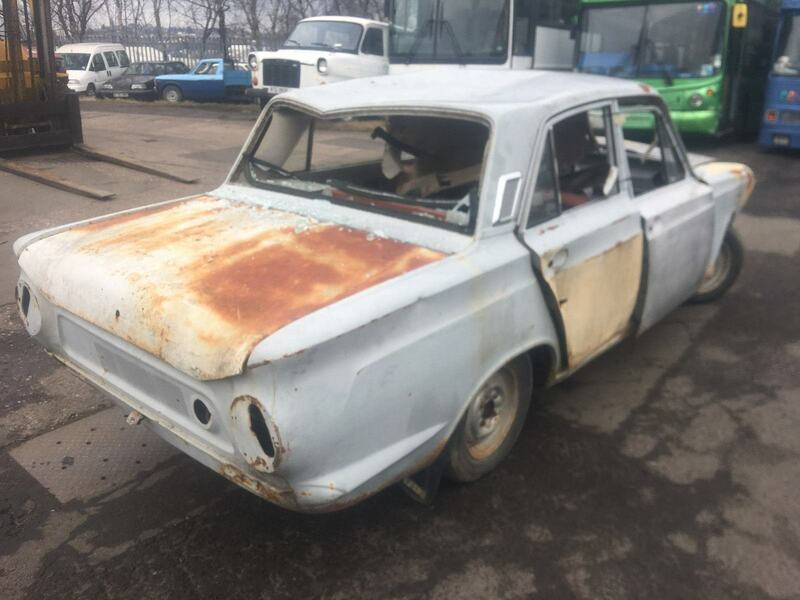 But given its condition it was going to cost a great deal more by the time it was restored. My partner thinks it needed a miracle. Perhaps not quite but some serious hard work certainly. Of course the value reflects the fact that it has a blue oval on the nose. It excited a mass of interest with 27 bids from no less than 13 bidders. People really wanted this car. But is such a massive area you might as well say it’s in Somerset. It was an interesting car not only imported but actually left hand drive. Usually I anticipate that people import cars because the cars have spent their life in the blazing sun. Thereby barring a bit of faded paint they need very little work. Remarkably he also states that it “comes with a spare roof”. Given a car stands upright and water falls from above, descending under gravity; normally the sills, floorpan and wheel arches lead in the rush to become one with nature. Once the roof has gone then really you’re dealing with merely compost and memories. What we don’t have here is a story. As mentioned in previous wreck of the week articles the stories of a car’s history are in many ways its most appealing aspect. It went to Spain with a little old lady who took it drag racing at weekends, that sort of thing. In fact we do not even know which country it was imported from. Given the need for a new roof I assume Atlantis. 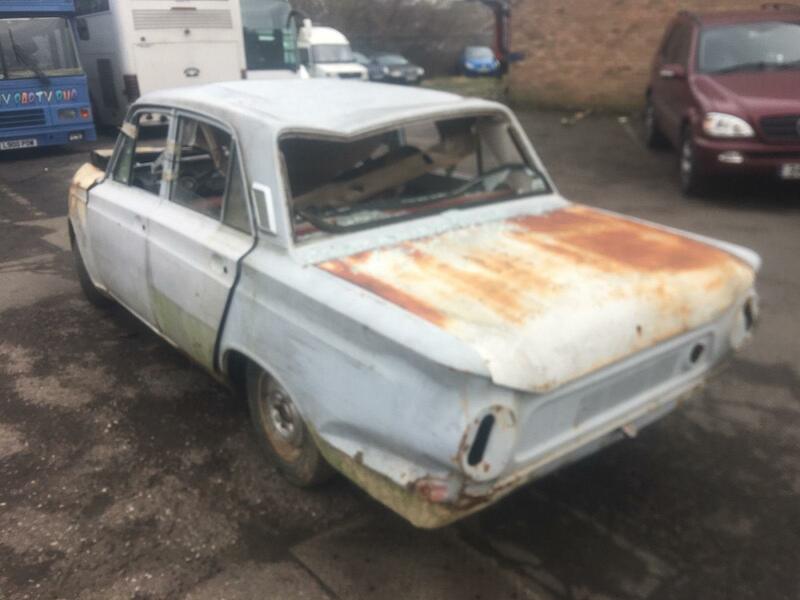 Unhelpfully it is listed as 1966 (sellers please list the full first registration date). There is no visible number plate so I am guessing pretty nigh impossible to derive the full first registration date from any public sources. I did not know that even though it is tax exempt you still need to apply for a tax. But apparently if registered pre 1977 now there is tax to pay. This seems tempting until you recognise the incredible rate of attrition of cars that age. Finding a drivable one which is still affordable will be your first challenge. Teeth grittingly he also lists it as MOT exempt. For my views on MOT exempt see a previous wreck of the week. 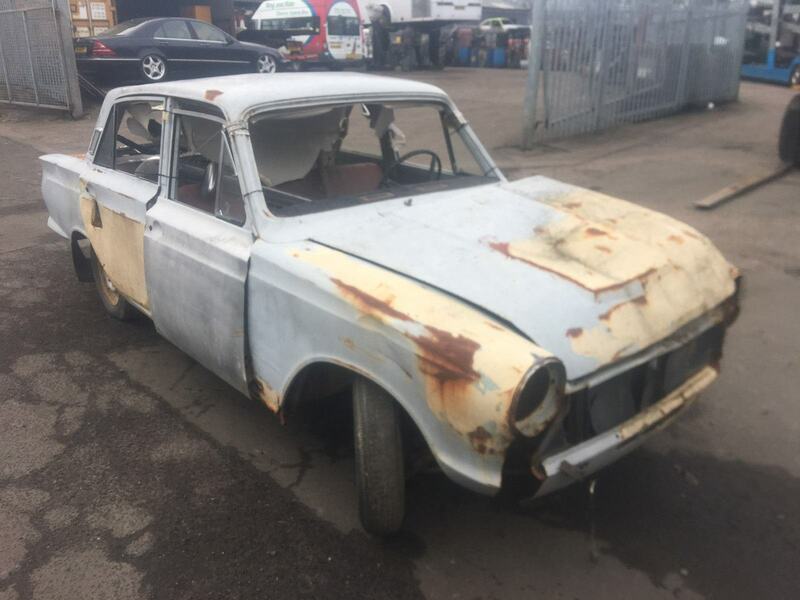 He states “Mot exempt from May so you’re able to register it as is and fix it up as you go along. You can even drive it and keep it on the street in this condition like a rat look beetle if you wish”. This sounds jaw-droppingly irresponsible (although I’m sure it sells cars). The car if subject to MOT would have to satisfy a number of safety checks before you can use it. Because it doesn’t need those checks, hey just drive it who’s going to notice? 57 demerits to the seller on that count alone. So with a heavy sigh let’s have a look at her. Firstly do not adjust your sets, the quality of the pictures really is of the “soft focus” variety. Given this is usually reserved for pictures of a quite different nature I assume it is not deliberate. It looks like it has been stock car racing in which the emphasis was on lots of body contact. Where can we find a straight panel? The LHS front wing looks beyond recovery, the door seems held in with straps, the glass (save the quarterlights) entirely absent. The bonnet is making a break for freedom, the rear subjected to a bizarre origami experiment. An odd chunk of metal seems to have been deliberately excised from the RHS front wing with no obvious purpose other than to disfigure the car. The passenger side door (remember it is LHD) is attached with straps as well but at least superficially looks a useful panel. The rear door seems to have been the loser in a door kicking competition. The door might be saveable, the wing doesn’t look like it. From what we can see the headlining is waving the white flag. Given the presence of overriders I’d say the front bumper is inside the car. Aha the need for a roof becomes plain, my goodness, what has been done to the poor thing. It’s possible it was rolled. Alternatively it’s been in some sunny scrapyard with another vehicle on top of it. Unearthed no doubt due to the escalating prices the Ford badge now attracts. 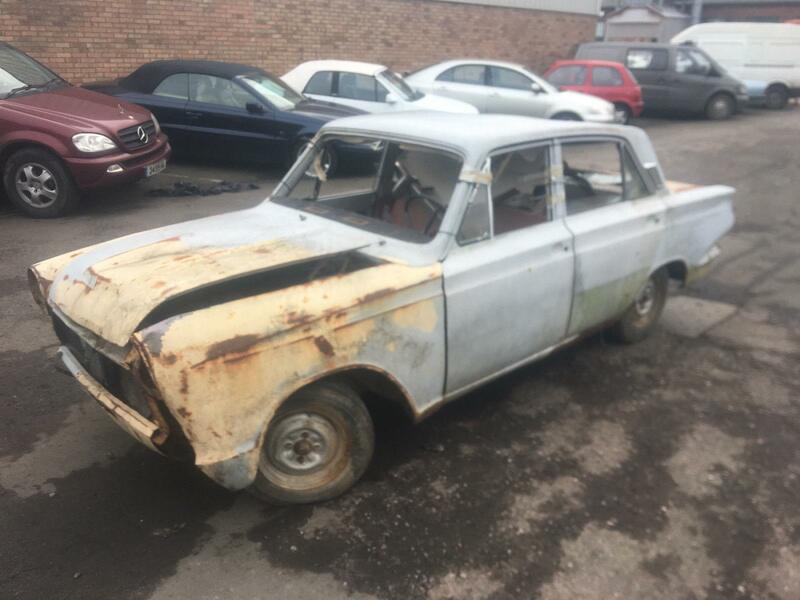 Even in this state it fetched £1,500.00 (roughly $2113 or €1724), which makes me wonder what on earth is a four door MK1 Cortina fetching now. Ok here’s a similar one https://www.carandclassic.co.uk/car/C957714 currently at £31000 (roughly $43662 or €35632) pheweee. Ok now it all makes sense. Various parts seem stuffed inside (together with a lot of glass granules). However even with my really strong glasses I can’t tell you what they are. In this shot even the intact rear has suffered a big ding on the LHS . There are no rear lights and judging by the vacant hole in the rear no fuel tank either. It is possible the LHS rear door is saveable however. Not exactly well disposed with photographs this listing (not that it affected it selling apparently). This is the last photograph in the series. If you remember the Cortina GT estate you will recall how shocking the state of the bulkhead was. 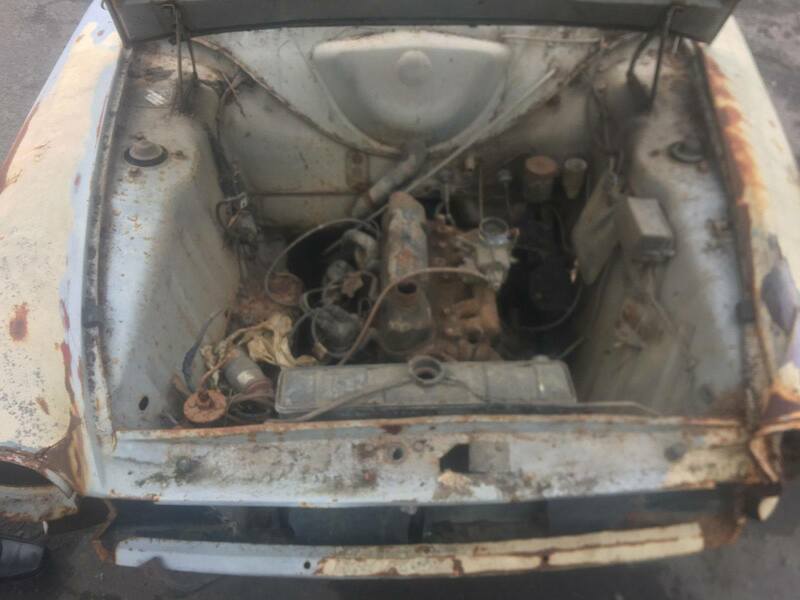 Kudos to whoever bought this – the engine bay is in good condition and remarkably the strut tops look intact. Unsurprisingly the LHS front wing looks the worst. I’m not certain if any of the mechanicals are saveable or how much is there, possibly a carb and a dizzy, parts of the brake system and a rad. However I think it safer to assume at the very least it’s going to need refurbishment and very likely replacement. So we’re talking a guy (or gal) who is either to metal what Michelangelo was to marble or someone with very deep restoration pockets. If you are that miracle worker ahem I mean purchaser let us know what you intend to do with her. (Unlike that site, which is about houses, this series of blogs is and will be all about automotive ancients). The Procrastination Pen Blog at WordPress.com.